Belém Tower (Torre de Belém) stands on the northern bank of the Tagus River and is an iconic symbol of Portugal’s Age of Discovery. 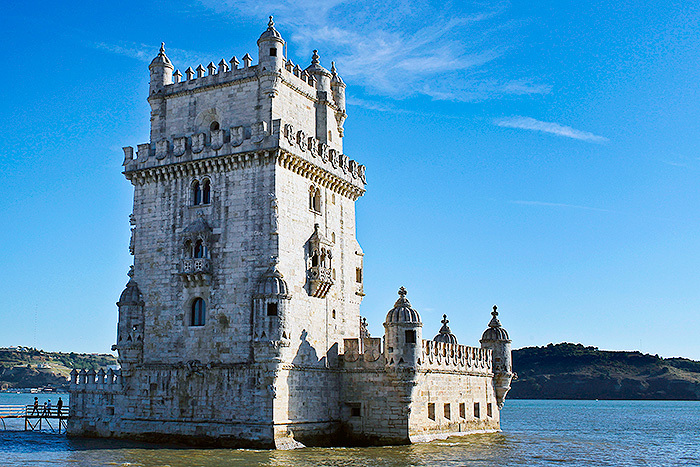 Built between 1514 and 1520, the tower served as a fortress to guard the entrance to the harbor in Lisbon. Located next to the Jerónimos Monastery, the tower was the starting point for many of the voyages that set sail during Portugal’s grand period of exploration and globalization. It was designated as a World Heritage Site by UNESCO in 1983. The tower was designed by architect Francisco de Arruda in the Manueline style. The exterior is covered in carved stone that depicts the Discoveries, historical figures such as St. Vincent, and the first European stone carving of a Rhinoceros. Visitors can climb the narrow interior spiral staircase of the tower and pass through the Governor’s Hall, The Kings’ Hall, the Audience Hall, the Chapel and Roof terrace. Belém Tower is closed on Mondays and on certain holidays. For more information on visiting hours and tickets, click here. Book a private tour! You may want to consider booking a private tour with an English-speaking guide. Your personal guide can provide you with information on the city and its historic sites. For more information on our Lisbon Panoramic tour, click here, and for information on all of our Lisbon tours, click here. Photo credit: © Turismo de Lisboa · All rights reserved.